Unless you’re a doctor, firefighter, or hold another job position that is widely considered as heroic, it is not often that one has the chance to save a life. That is, unless you give blood. Then, however indirectly, you could be saving someone’s life you don’t even know, simply by participating in a process that could take minutes. Every year, Granite Bay High School students participate in donating blood, and have given anywhere from 100 to 180 pints of blood. More importantly, the very blood someone donates could save a life. According to Joanna Szyrynski, who has worked with Vitalant (formerly known as Blood Source) for several years, giving blood can be exactly what saves someone in need. “You know, most of us don’t think about blood donations unless somebody that we know or are close friends with or family with needs blood,” said Szyrynski. “So it could be like a long-term illness or surgery, and then we realize that somebody used, for example, 20 pints in one day, and if it wasn’t available on the shelf, that person might not have made it,” said Szyrynski. This appeal of possibly saving a life by making a small contribution is often what motivates people to give blood, including Anthony Davis, who teaches Honors English for sophomores at GBHS. However, his motives changed when it became a personal matter. “It became more personal for me when my son was diagnosed with a brain tumor and needed it to have surgically removed and have pints of blood on hand during the surgery, just in case,” Davis said. “So it helped me see firsthand the need for the blood, and a better understanding of how much they end up having on hand and having to dispose of if it goes unused,” said Davis. As Szyrynski said before, and Davis realized firsthand, blood donations can be an essential part of surgery, increasing the value of those donations tenfold. In addition, blood donations are not everlasting. They have a limited shelf life, and a constant supply is crucial to the act of preserving life. “We encourage everybody and we talk about the importance of giving, because the red [blood] cells can be kept on the shelf for only 42 days. They cannot be frozen and always have to be fresh,” said Szyrynski. So even if someone wanted to help with blood donations in another way, they couldn’t. As GBHS students, many feel that they don’t have many opportunities to save lives — after all, it isn’t exactly a common occurrence on a high school campus in the middle of the suburbs. As a result, the blood drive provides a unique opportunity to GBHS students, providing a chance to step away from academics for a portion of their day, and do something with Vitalant that they can truly be proud of. Unfortunately, not everyone chooses to do so, and some aren’t even able to do so. 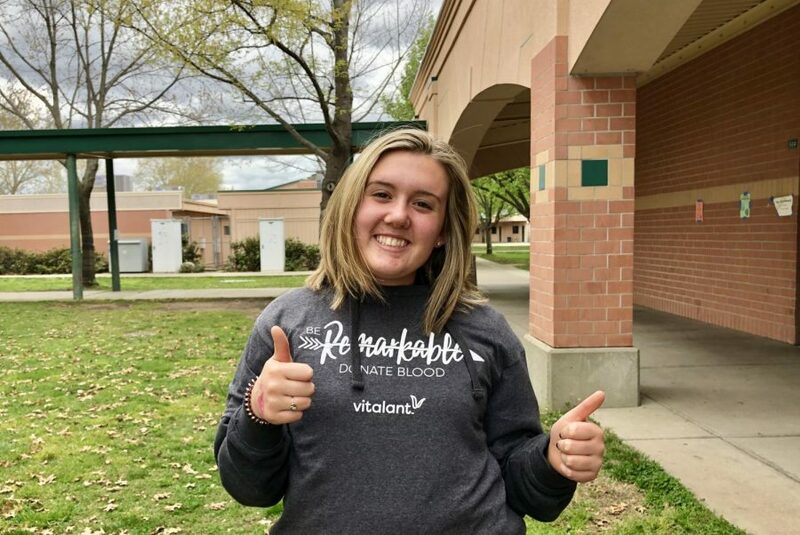 “Sometimes they don’t weigh enough, or they don’t have enough iron, or they got sick,” said Tamara Givens, who teaches Student Government at GBHS and set up the blood drive with Vitalant. However, to those who can donate blood, doing so can be the difference between life and death for someone who needs it. “It’s a really, really small sacrifice to make,” Davis said. “Knowing full well that you’re doing something good in the community, you really are helping people.